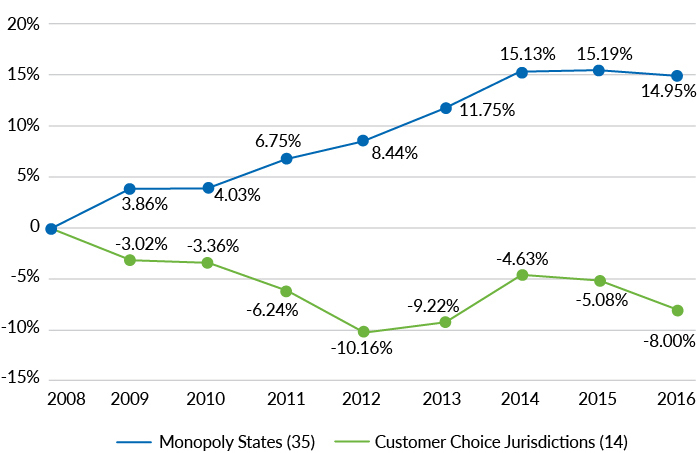 Prices in states with competition and choice have trended downward while monopoly prices rise, writes RESA's Darrin Pfannenstiel. The following is a guest post from Darrin Pfannenstiel, president of the Retail Energy Supply Association, a retail energy supplier trade group. To submit your own viewpoint article, please review these guidelines. It was only 20 years ago when state and federal policy makers began to introduce competitive reforms to the staid monopoly regulated electric utility industry. While the Federal Energy Regulatory Commission acted to establish the wholesale power markets that now dominate most of the country, many states acted to open up retail markets so for the first time in more than a century electricity consumers could choose from among competing suppliers. A considerable amount of debate and deliberation went into these competitive market reforms for electricity. Indeed, until California’s well-intentioned but poorly conceived first-in-the-nation experience with electricity competition, it appeared that a majority of states across the country would restructure their electricity markets to enable competition. But after California, many states poised to enact restructuring declined to do so, and others that had adopted competitive reforms reversed course. Nevertheless, slightly more than a dozen states and the District of Columbia, which account for one-third of all electricity generation and consumption in the country, persisted with the task. They learned from California’s mistakes and created vibrant retail competition programs that have grown and prospered over the past 20 years, benefiting consumers with abundant choices among increasingly innovative, clean and cost-competitive electricity product and service offerings. And as shown in a new white paper commissioned by the Retail Energy Supply Association, "RESTRUCTURING RECHARGED – The Superior Performance of Competitive Electricity Markets 2008-2016," the verdict is in and consumers with competitive choices are disproportionately benefiting. Using U.S. Energy Information Administration data, the white paper by Philip R. O’Connor, Ph.D., former chairman of the Illinois Commerce Commission, found that competitive choice jurisdiction customers fared demonstrably better in terms of price, investment and efficiency than did those who remained under monopoly regulation. 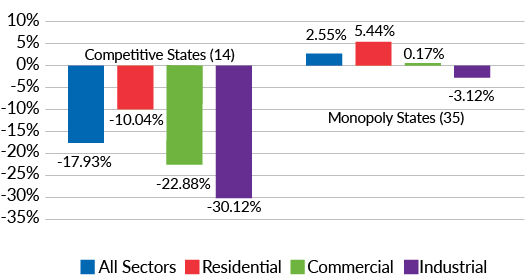 Weighted average prices in the group of 35 monopoly states have risen nearly 15% while in the 14 competitive markets total weighted average prices have declined 8%. All-sector weighted average price trends (2008-2016). It is no surprise then that relatively sophisticated commercial and industrial electricity customers have widely embraced competition, and we’ve a seen a majority of customers in those classes benefit by purchasing electricity from non-utility suppliers in competitive choice states. But residential customers are increasingly benefiting from the competitive marketplace too. Between 2003 and 2008, the number of residential accounts served in competitive jurisdictions by non-utility providers more than tripled from about 2.3 million to 7.1 million, and more than doubled again since to average more than 16.4 million annually. For jobs-producing commercial and industrial customers, between 2003 and 2008 those served by non-utility suppliers grew 240%, from 436,000 to nearly 1.6 million. Since then we’ve seen a near doubling again with competitive commercial and industrial accounts averaging more than 2.9 million and exceeding 3 million in 2016. It is against this backdrop of growing evidence that competitive markets are delivering real and tangible benefits in terms of pricing and innovation that policy makers in several states are beginning to consider once again taking steps to introduce competition in electricity to retail customers. Given the demonstrably superior performance of retail choice markets, a coming second wave of retail electricity market restructuring has begun, as evidenced by ongoing debates in Nevada, California, Nebraska, Michigan and elsewhere. Consumers want and expect choices. Given the preponderance of evidence, it makes little sense to cling to a monopoly regulatory model for electricity that is a vestige of 19th century economic thinking and a barrier to the efficient 21st century clean-energy economy that consumers and policymakers seek to embrace.